I can’t decide exactly how to rate this one. The writing is brilliant, but the actual story was harder to rate. 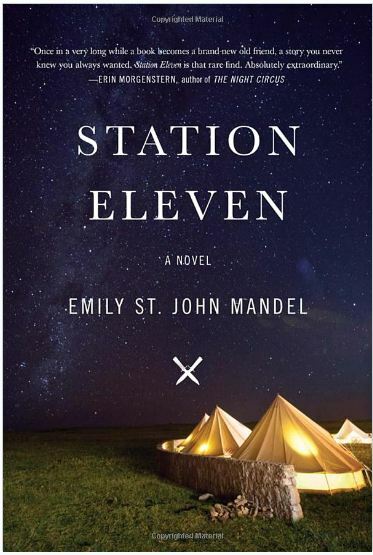 Station Eleven is essentially about one person. Or rather, many people, but only because they are connected somehow to Arthur Leander. Famous actor, Arthur Leander, dies of a heart attack on stage while playing one of his most coveted roles as King Lear in the Shakespeare theater production. Jeevan Chaudhary leaps to the stage to perform CPR, while child actress, Kirsten Raymonde, watches helpless as Arthur dies. It is also on this night that the Georgia Flu, a deadly virus from Russia, arrives in the United States via a plane full of “patient zeroes”. Anyone who comes in contact with the virus is dead within 48 hours. And by “anyone”, I mean “everyone” because nearly the entire population of the Earth has succumbed to the disease. Only a small handful of lucky survivors roam in what has become treacherous territory. No more electricity. No more phones. No more gas. No more cars. No more airplanes. No more food trucks. No Internet. No nothing. Flash forward 20 years after the apocalypse, Kirsten is acting with a Traveling Symphony. Jeevan has walked a thousand miles to a small settlement. And everyone else who was in Arthur’s life is either dead or spread out in the new world. I found myself utterly intrigued with the story when it was about the post-apocalyptic “New World”, but the story was nearly half about Arthur’s life and a comic book. (yes, a comic book.) Half way through the book I was losing interest because there was no real plot. Now, the intricate web of details and stories and how they all connected, from different points of view, was straight up brilliant writing. I saw early on that I needed to pay serious attention to each scene and it paid off, because I caught or remembered details that made me want to applaud the writing effort. But otherwise, all the connections to Arthur and the comic book didn’t seem to matter very much. I felt like this book fell short for me. I kept hoping for there to be deeper meaning or that all the focus on Arthur would actually mean something in the end. Brilliant writing, but the actual story fell flat for me.